This entry was posted on March 28, 2019 by wowvow. There are so many little tips and tricks that not only help you make your DIY wedding invitations quicker but they'll also help the finished results look professional too! 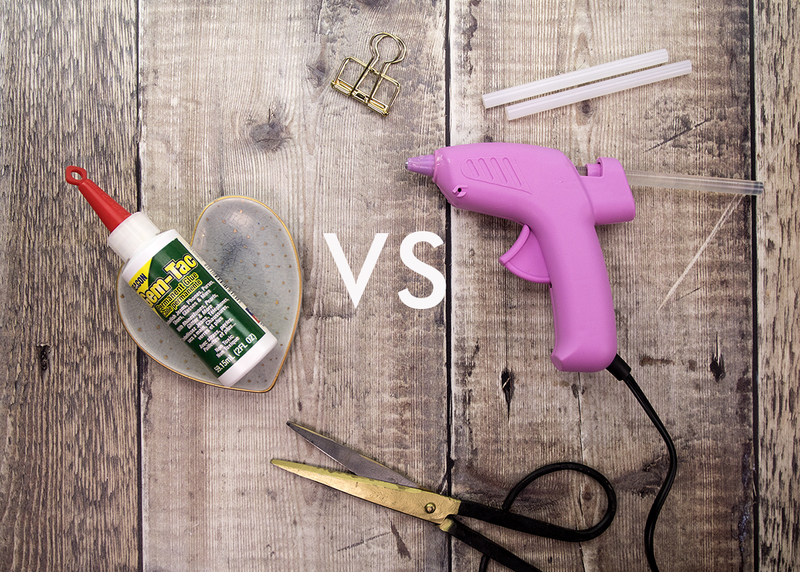 and two of the most popular are 'Hot Melt Glue' from a glue gun and 'Gem-Tac'. Here we compare the advantages and disadvantages of both! 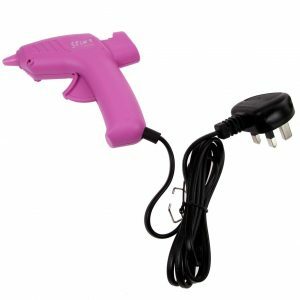 Hot melt glue from glue guns is a fabulously quick, easy and convenient adhesive to use. There's very little mess (any 'stringiness' is easily removed) but you have to be really quick and apply it to the surface before it cools (and it cools surprisingly quickly)! This can be quite an advantage as you can move onto the next stage of your project. It's sensible to consider the surface you're attaching it to, if it's cold (like a metal diamante embellishment) then the glue can cool so quickly that you don't achieve a good bond. In our tests, the hot melt glue was quick, convenient and achieved quite a good bond but the embellishment could be removed with not too much effort or damage to the card stock. We love hot melt glue for its convenience but when using it we carefully consider how permanent we want the bond to be. you can reposition your embellishment if you feel it's just not quite in the right place. In our tests, we found that the embellishment stuck on with Gem-Tac was incredibly difficult to remove and that the only way to remove it was to tear the card itself. You can see how badly damaged the card stock is afterward! 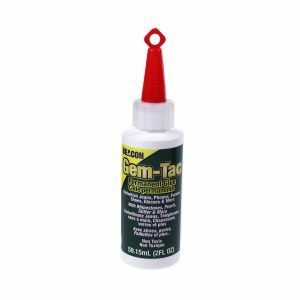 Gem-Tac is a great multi-purpose adhesive that dries clear. It can be used for bonding porous materials such as fabric, wood and suede to smooth surfaces such as glass, vinyl and metal. It's also a permanent adhesive that bonds gems, sequins, glitter and rhinestones to fabrics so it's ideal for attaching Swarovski crystals if you don't have access to a heat tool. Both types of glue have their advantages and disadvantages but for the permanency of the bond, we prefer Gem-Tac. A fantastic craft tool that can be used with sealing wax sticks for creating wax seals too!